The nursing diagnosis of Impaired Tissue Integrity is defined as damage to mucous membrane, corneal, integumentary, or subcutaneous tissues. Use this guide to help develop your Impaired Tissue Integrity care plan. The skin, cornea, subcutaneous tissues, and mucous membranes act as a physical barrier preventing penetration against threats from the external environment. These defenses are always ready and prepared to defend the body from any harmful substances. However, these tissues can be damaged by several circumstances. Factors that can cause impaired tissue integrity or tissue damage include physical trauma like thermal injury (e.g., frostbite); chemical injury such as reactions to drugs, especially chemotherapeutic drugs; radiation; and ischemia. Some parts of our bodies can repair themselves considerably well after injury, but others don’t repair at all. Other times, the damaged tissue may be replaced by connective tissue. If the damaged tissue is left untreated, the person is at risk for local or systemic infection and/or necrosis (tissue death). People are at risk for impaired tissue integrity if they have difficulty moving and are unable to easily change position while seated or in bed. It may also be due to having generally poor health or weakness, paralysis, injury or illness that requires bed rest or wheelchair use, recovery after surgery, chemotherapy, and individuals with altered sensation. Some parts of our bodies can repair themselves considerably well after injury, but others don’t repair at all. Other times, the damaged tissue may be replaced by connective tissue. If the damaged tissue is left untreated, the person is at risk for local or systemic infection and/or necrosis (tissue death). People are at risk for impaired tissue integrity if they have difficulty moving and are unable to easily change position while seated or in bed. It may also be due to having generally poor health or weakness, paralysis, injury or illness that requires bed rest or wheelchair use, recovery after surgery, chemotherapy, and individuals with altered sensation. Other factors also include age, weight loss, poor nutrition and hydration, excessive moisture and dryness, smoking, and other conditions affecting blood flow. Here are some factors that may be related to the nursing diagnosis Impaired Tissue Integrity. Use these statements below for your “related to” in your diagnostic statement. Patient reports any altered sensation or pain at site of tissue impairment. Patient demonstrates understanding of plan to heal tissue and prevent injury. Patient describes measures to protect and heal the tissue, including wound care. Patient’s wound decreases in size and has increased granulation tissue. 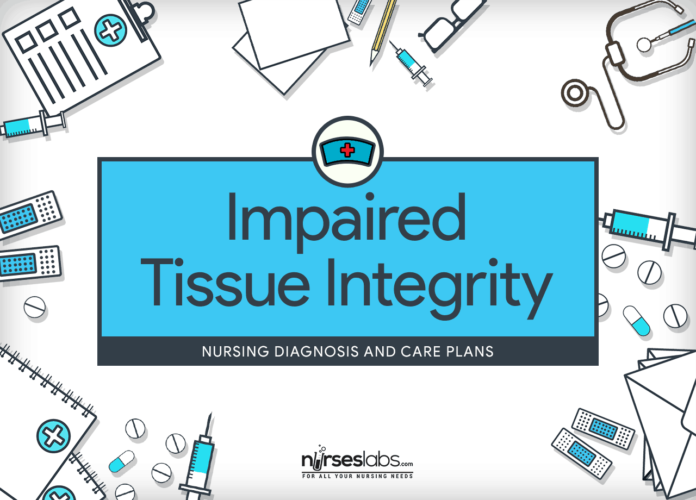 Assessment is required in order to recognize possible problems that may have lead to Impaired Tissue Integrity as well as identify any episode that may transpire during nursing care. Determine etiology (e.g., acute or chronic wound, burn, dermatological lesion, pressure ulcer, leg ulcer). Prior assessment of wound etiology is critical for proper identification of nursing interventions. Assess site of impaired tissue integrity and its condition. Redness, swelling, pain, burning, and itching are indication of inflammation and the body’s immune system response to localized tissue trauma or impaired tissue integrity. Assess characteristics of wound, including color, size (length, width, depth), drainage, and odor. These findings will give information on extent of the impaired tissue integrity or injury. Pale tissue color is a sign of decreased oxygenation. Odor may be a result of presence of infection on the site; it may also be coming from a necrotic tissue. Serous exudate from a wound is a normal part of inflammation and must be differentiated from pus or purulent discharge, which is present in infection. Assess changes in body temperature, specifically increased in body temperature. Fever is a systemic manifestation of inflammation and may indicate the presence of infection. Assess the patient’s level of distress. Pain is part of the normal inflammatory process. The extent and depth of injury may affect pain sensations. Know signs of itching and scratching. The patient who scratches the skin in attempts to alleviate extreme itching may open skin lesion and increase risk for infection. Assess patient’s nutritional status; refer for a nutritional consultation and/or institute dietary supplements. Inadequate nutritional intake places the patient at risk for skin breakdown and compromises healing further causing impaired tissue integrity. Classify pressure ulcers in the following manner: Wound assessment is more reliable when classified in such manner according to the National Pressure Ulcer Advisory Panel. Pay special attention to all high-risk areas such as bony prominences, skin folds, sacrum, and heels. Systematic inspection can identify impending problems early. Identify a plan for debridement when necrotic tissue (eschar or slough) is present and if compatible with overall patient management goals. Healing does not transpire in the appearance of necrotic tissue. Monitor site of impaired tissue integrity at least once daily for color changes, redness, swelling, warmth, pain, or other signs of infection. Systematic inspection can identify impending problems early. Monitor status of skin around wound. Monitor patient’s skin care practices, noting the type of soap or other cleansing agents used, temperature of water, and frequency of skin cleansing. Individualize plan is necessary according to patient’s skin condition, needs, and preferences. Provide tissue care as needed. Each type of wound is best treated based on its etiology. Skin wounds may be covered with wet or dry dressings, topical creams or lubricants, hydrocolloid dressings (e.g., DuoDerm) or vapor-permeable membrane dressings such as Tegaderm. An eye patch or hard, plastic shield for corneal injury. The dressing replaces the protective function of the injured tissue during the healing process. Keep a sterile dressing technique during wound care. This technique reduces the risk of infection in impaired tissue integrity. Premedicate for dressing changes as necessary. Manipulation of profound or extensive cuts or injuries may be painful. Wet thoroughly the dressings with sterile normal saline solution before removal. Saturating dressings will ease the removal by loosening adherents and decreasing pain, especially with burns. Monitor patient’s continence status and minimize exposure of skin impairment site and other areas to moisture from incontinence, perspiration, or wound drainage. This is to prevent exposure to chemicals in urine and stool that can strip or erode the skin causing further impaired tissue integrity. If patient is incontinent, implement an incontinence management plan. This is to prevent exposure to chemicals in urine and stool that can strip or erode the skin. Administer antibiotics as ordered. Wound infections may be managed well and more efficiently with topical agents, although intravenous antibiotics may be indicated. Tell patient to avoid rubbing and scratching. Provide gloves or clip the nails if necessary. Rubbing and scratching can cause further injury and delay healing. Encourage a diet that meets nutritional needs. A high-protein, high-calorie diet may be needed to promote healing. Monitor for proper placement of tubes, catheters, and other devices. Assess skin and tissue affected by the tape that secures these devices. Mechanical damage to skin and tissues as a result of pressure, friction, or shear is often associated with external devices. Check every two (2) hours for proper placement of footboards, restraints, traction, casts, or other devices, and assess skin and tissue integrity. Mechanical damage to skin and tissues (pressure, friction, or shear) is often associated with external devices. For patients with limited mobility, use a risk assessment tool to systematically assess immobility-related risk factors. This is to identify patients at risk for immobility-related skin breakdown. Do not position the patient on site of impaired tissue integrity. If ordered, turn and position patient at least every 2 hours, and carefully transfer patient. This is to avoid the adverse effects of external mechanical forces (pressure, friction, and shear). Maintain the head of the bed at the lowest degree of elevation possible. To reduce shear and friction. Educate patient about proper nutrition, hydration, and methods to maintain tissue integrity. The patient needs proper knowledge of his or her condition to prevent impaired tissue integrity. Teach skin and wound assessment and ways to monitor for signs and symptoms of infection, complications, and healing. Early assessment and intervention help prevent the development of serious problems. Instruct patient, significant others, and family in the proper care of the wound including hand washing, wound cleansing, dressing changes, and application of topical medications). Accurate information increases the patient’s ability to manage therapy independently and reduce the risk for infection. Encourage the use of pillows, foam wedges, and pressure-reducing devices. To prevent pressure injury. Educate the patient the need to notify the physician or nurse. This is to prevent further impaired tissue integrity complications.